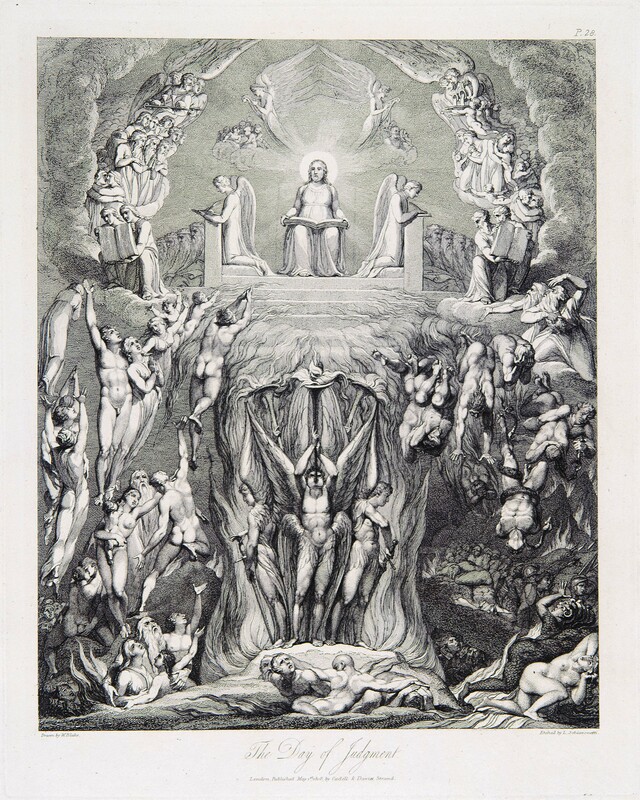 This pamphlet includes all of Blake’s pictures of the Last Judgment that are accessible in public collections. It does not include the earliest preparatory sketch for the Rosenwald drawing (the so-called “Tatham-Robertson drawing,” listed as no. 643 in Martin Butlin’s forthcoming catalogue raisonné)[e] which was sold to a private British collector in 1949. 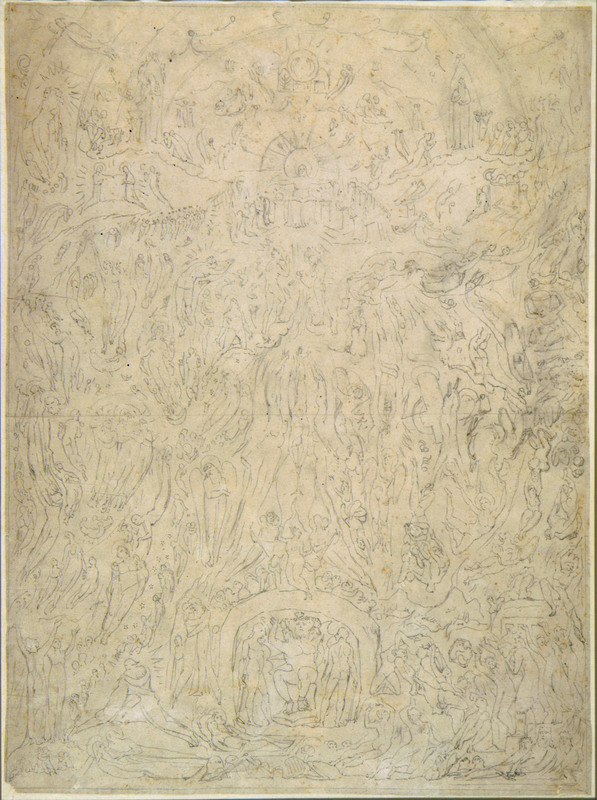 It does not include two other drawings which have been untraced since the nineteenth century, the first (Butlin 640) is probably a preliminary drawing for the Pollok House version which was purchased by Flaxman in 1806 (see Bentley, Blake Records, 575). The second is a tracing (Butlin 647) which may be identical with the tracing of the Rosenwald drawing reproduced in this pamphlet (no. 6, Tatham-Bateson drawing, Butlin 646). 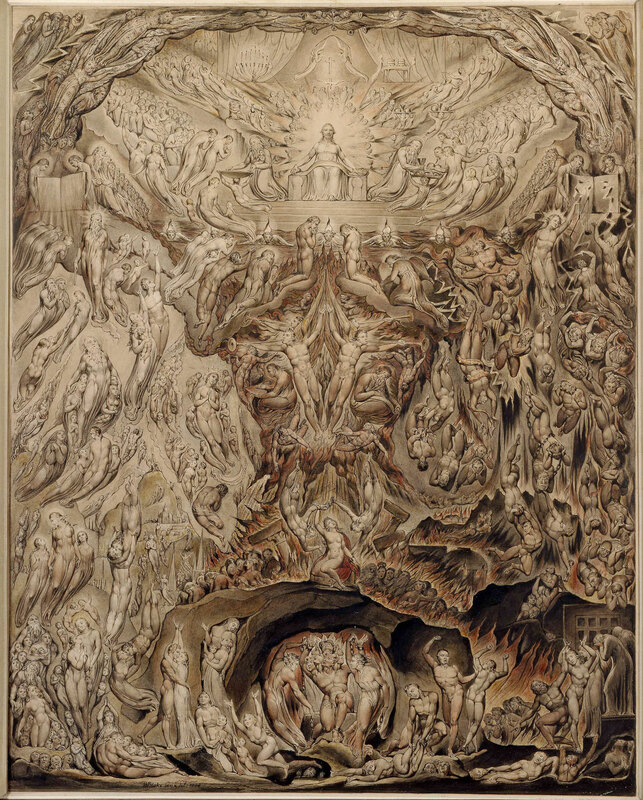 The most important item missing is, of course, the five by seven foot tempera with gold, the climactic version of the Last Judgment which dropped from sight shortly after Blake’s death in 1827. The pictures are arranged in chronological order, although it should be noted that the year in which the Schiavonetti engraving was published (1808) is not necessarily the year Blake made the drawing for it, and the date of the Rosenwald drawing is disputed (Keynes places it in 1810, A. S. Roe argues for 1820-25). Four distinct treatments of the theme are exhibited here: (1) the Pollok House watercolor; (2) the Petworth House watercolor; (3) the Blair’s Grave engraving; (4) the Rosenwald drawing, together with a preliminary sketch (the Texas drawing) and the tracing mentioned above. 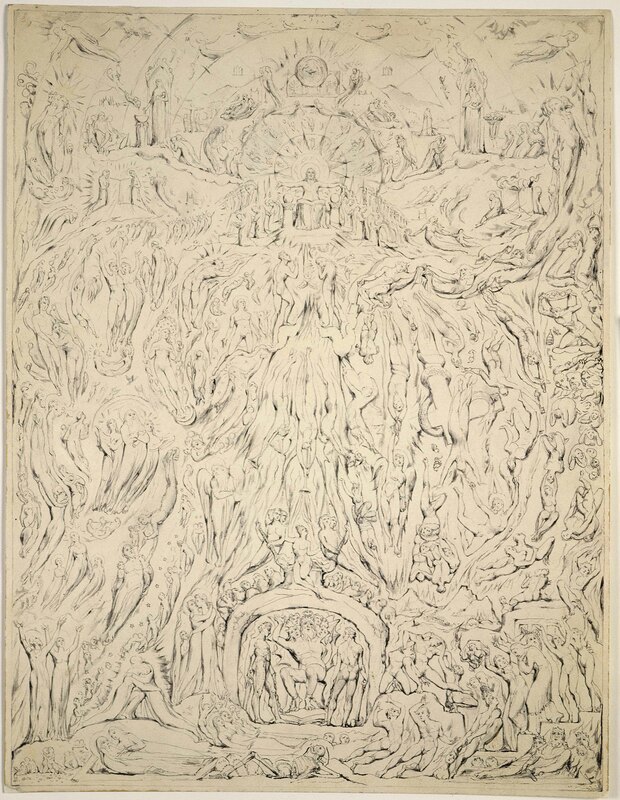 It is generally assumed that the lost tempera was based upon the Rosenwald drawing, although the discrepancies between Blake’s drawing and his notebook description (A Vision of the Last Judgment) suggest that the composition was further modified in the final tempera. 1. A Vision of the Last Judgment. Pen and watercolor over pencil, 19 1/2″ × 15 5/16″ on paper. Signed “WBlake inv. 1806.” Butts-Stirling Maxwell. Reproduced by permission of the Glasgow Museums and Art Galleries, Stirling Maxwell Collection, Pollok House. 2. The Last Judgment. Pen and watercolor over pencil, approx. 20″ × 15 1/2″. Signed “WBlake inv. 1808.” Egremont-Leconfield-Wyndham. Reproduced by permission of the National Trust, Petworth House, Sussex. 3. The Day of Judgment. Engraving after Blake by Schiavonetti. Published 1808 as Plate XII of Blake’s Illustrations of Blair’s Grave. 4. 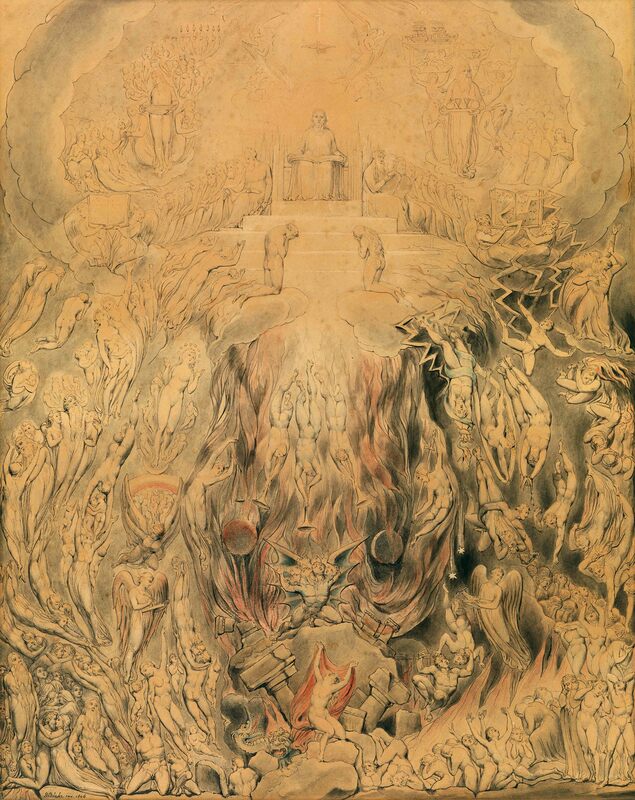 The Last Judgment. Pencil, pen, and wash, approx. 17 3/8″ × 13″ on paper. 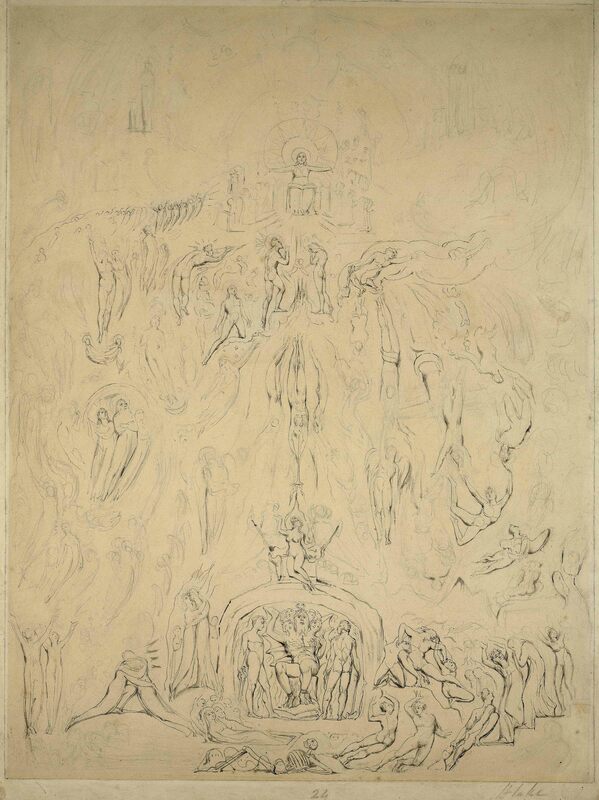 Inscr., not by Blake, “Blake,” and on back, probably by Tatham, “The Original Drawing of Blake’s Last Judgment.” A preliminary sketch for no. 5, the Rosenwald drawing. Tatham-Aspland-Rigall-Cockerell-Hanley. Reproduced courtesy of the Humanities Research Center, The University of Texas at Austin. 5. The Last Judgment. Pen and wash over pencil, 17 1/2″ × 13 5/16″ on paper. Butts-White. Reproduced by permission of the National Gallery of Art, Washington, D.C., Rosenwald Collection. 6. The Last Judgment. Pencil tracing in drawn frame, 18 1/4″ × 13 9/16″ on tracing paper folded or joined across the middle. A tracing of the Rosenwald drawing (no. 5), possibly by Blake. Tatham-Gilchrist-W. Bateson. Present location unknown. Photo courtesy of John Grant.